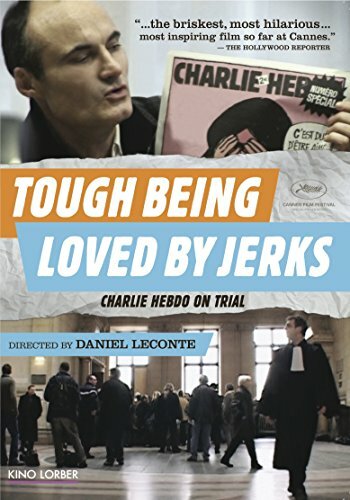 NEW YORK, NY - June 1, 2015 - Kino Lorber is proud to announce the DVD release of Tough Being Loved By Jerks , a documentary directed by Daniel Leconte examining the controversy that erupted after the French satirical paper Charlie Hebdo published caricatures of the Prophet Muhammad in 2006, and the events that followed. Director Daniel Leconte followed in real time the subsequent court proceedings brought against the paper's editor, and his film presents a provocative and thoughtful look at questions surrounding freedom of the press and the challenges to democracy posed by fundamentalism. The film screened at the Cannes Film Festival in 2008, where it was nominated for the Golden Camera award. Kino Lorber released Tough Being Loved By Jerks in limited engagements across the country earlier in 2015. Now, this timely documentary is set to street on DVD June 9, with a SRP of $29.95. On the morning of January 7th, 2015, the offices of the French satirical newspaper Charlie Hebdo were attacked, and twelve people were killed. Two brothers affiliated with Al-Qaeda in the Arabian Peninsula (AQAP) carried out the crime, a reaction to Hebdo's publication of cartoons of the Prophet Muhammad. The documentary Tough Being Loved By Jerks turns back to the calendar to 2006, just after the publication of the caricatures of Muhammad, and documents the firestorm of controversy that it provoked. Director Daniel Leconte captured the court proceedings brought against Charlie Hebdo by the Great Mosque of Paris, the World Muslim League and the Union of Islamic Organizations of France. It is a reflection on Islam, on freedom of the press, on the state of public opinion in French society, but also an endeavor to answer the challenges that fundamentalism poses to all democracies. It also stands as a tribute to the courage and principles of the Charlie Hebdo staff, who lives were taken far too soon. With a library of 1,000 titles, Kino Lorber Inc. has been a leader in independent art house distribution for over 30 years, releasing over 25 films per year theatrically under its Kino Lorber, Kino Classics, and Alive Mind Cinema banners, including five Academy Award� nominated films in the last seven years. In addition, the company brings over 70 titles each year to the home entertainment market with DVD and Blu-ray releases under its five house brands, distributes a growing number of third party labels, and is a direct digital distributor to all major platforms including iTunes, Netflix, HULU, Amazon, Vimeo, Fandor and others.